Product chevron-down@1x Created with Sketch. Solutions chevron-down@1x Created with Sketch. Integrations chevron-down@1x Created with Sketch. Resources chevron-down@1x Created with Sketch. Handle support and service requests and respond promptly with the perfect Request Management software. HappyFox service request management system is suited to handle all your service requests from one interface. Be it customers or staff, bring in all requests into one common system, prioritize and categorize based on the requirement for your support agents to manage them. One of my key clients is now receiving 95% of support tickets being responded to within 2 hours. They are impressed! This is something I have not been able to demonstrate before. 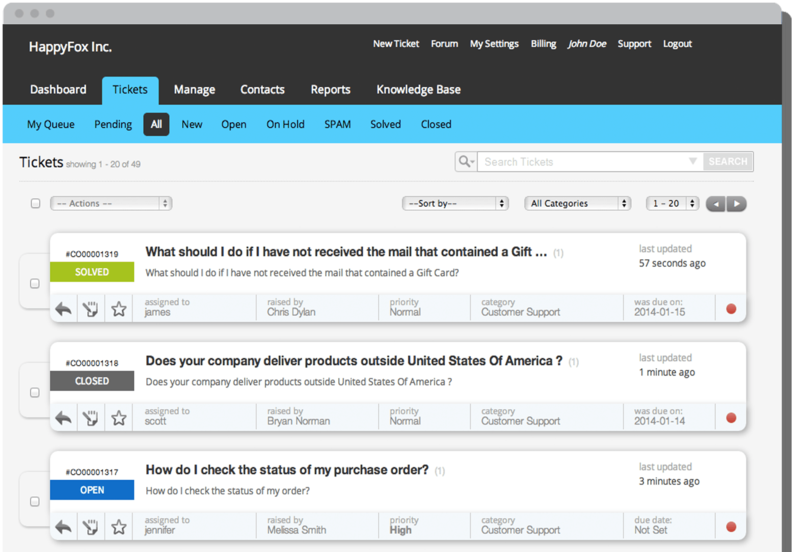 Support Request SoftwareMaximize employee productivity by responding to requests faster. The HappyFox service request management system allows you to keep track of all the requests that come into your system. HappyFox is a multi-channel request management software which supports requests via email, live-chat and voice calls. Role based Access ControlNot all of your support staff will be able to handle all the requests. Categorize the requests based on their severity and complexity, limit access accordingly and make sure that no service request is stuck in the wrong employee’s support queue. SLA ManagementHappyFox brings about a novel way for service request management by giving you a flexible SLA model. Based on your work schedule, you can decide how many hours of the day are to be calculated for the SLA, so that you can exactly track the time spent on a ticket and improve performance. Custom FieldsRequests can be submitted via customizable web forms provided by HappyFox. You can associate these custom fields to single or multiple categories, use these fields to manage additional contacts, ticket specific information etc. Measure PerformanceThe easiest way to optimize the effort of your help desk staff is to measure their performance, identify areas of improvement and eliminate pain points that might cause delays in service delivery. HappyFox is a request tracking software that provides useful reports of your staff performance which you can even schedule periodically to be received on your mailbox. Simplified Request ManagementHappyFox request management system lets you clone, merge or relate similar tickets so that you do not have multiple tickets of the same type sitting and clogging your system and utilizing more of your support staff effort. Split issues and attach relevant images to make identifying tickets easier. Get a one-on-one demo, that's quick and focused on your needs. has become some of the easiest tasks to execute, thanks to HappyFox. HappyFox - The best online web based help desk software & Knowledge base software solution. Copyright © 2018, HappyFox Inc. All Rights Reserved.